Silenced for 1,600 years, the "heretics" speak for themselves in this account of the Priscillianist controversy that began in fourth-century Spain. 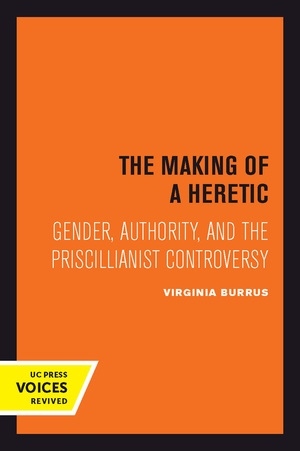 In a close examination of rediscovered texts, Virginia Burrus provides an unusual opportunity to explore heresy from the point of view of the followers of Priscillian and to reevaluate the reliability of the historical record. Her analysis takes into account the concepts of gender, authority, and public and private space that informed established religion's response to this early Christian movement. Priscillian, who began his career as a lay teacher with particular influence among women, faced charges of heresy along with accusations of sorcery and sexual immorality following his ordination to the episcopacy. He was executed along with several of his followers circa 386. His purportedly "gnostic" doctrines produced controversy and division within the churches of Spain, dissension that continued into the early decades of the fifth century. Burrus's thorough and wide-ranging study enlarges upon previous scholarship, particularly in bringing a feminist perspective to bear on the gendered constructions of religious orthodoxies, making a valuable contribution to the recent commentary that explores new ways of looking at early Christian controversies.